Jeeps, 4x4, Off Roading, Car Audio, Gaming, Computers. CommonSyns replied to SnowDrifter's topic in Off Topic - Random, Misc posts - the forum "Junk Drawer"
https://www.youtube.com/watch?v=y0yjATpkDxM#t=41 Edit: Wont let me embed the video. A new Eminem song that dropped yesterday. CommonSyns replied to BeatBox's topic in Off Topic - Random, Misc posts - the forum "Junk Drawer"
Just in time for mothers day, Great job Eminem. CommonSyns replied to MoFatt0529's topic in Off Topic - Random, Misc posts - the forum "Junk Drawer"
Used to drink coke all the time, switched to pepsi, I'm from up north moved to TN. If I had to choose a soda to my taste it would be Cream Soda from A&W or Jones cream soda, Jones cream soda tastes like cotton candy. CommonSyns posted a topic in Off Topic - Random, Misc posts - the forum "Junk Drawer"
Just wondering if anyone and where everyone gets their clothes online, It seems that I would have to do that to get the clothes I would like, only place I really have where I live in Tn is a super Walmart and a TJ Max that's horribly understocked. I know of Amazon, but they don't seem to have what I'm looking for. Looking for unique stuff, Jackets, Shorts, Shirts, Pants, Shoes, Normal Sneakers. Out of the ordinary clothes, Like normal sneakers with steel toes or composite toes. Places where you would get specialized apparel, Hunting apparel, Tactical, Work specialized / Heavy Duty, Casual and comfortable clothes.. One article of clothing I'm looking for would be a normal zip hoodie lined in, I think faux fur, Its Fox's racing hoodie made for men called fox sasquatch, most comfortable hoodie I've ever come across, I'd still have it also if I didn't loose it. I think it would be cool to just be able to purchase the bare hoodie with no logo, So I could put something on it. I want to call this rugged cool looking apparel but its real name is fashion. Normally I don't particularly care what I wear, I just put on what what I normally wear year round, Jeans, and a short sleeve. with a jacket from up north, Although the jacket I have from up north is clearly not needed here in TN during the winter months. I just wear heavier shirt, As I adjust to this weather I'm sure I'll feel different about the weather. Throw out some brand names that's good. Looking for anything and everything in between. Even performance jackets and gloves, boots. Just post some websites you think would be good. Some pictures of the hoodie I mentioned. EDIT- Added Pictures of hoodie. Off road or sound build? CommonSyns replied to CommonSyns's topic in Off Topic - Random, Misc posts - the forum "Junk Drawer"
Did you ever get the feeling that the clutch was going to burn? Also got any pics of your Yota? Would love to see them, What did you do to your yota? Trying to get ideas what do to. Ideally I would want a dana 44 both front and rear with 4.8 gears I believe, I'm well aware that the dana 35's are weak. SYE's are needed of course, but I also know you don't need them for some lift heights only if you go above a certain height. For example, I have a friend with an XJ with dana 35's and 35's Km2s and he off roaded for years before switching out, and did burn out and such. Granted the Km2's arent true to size so it really was a 34". Another friend with an XJ had a 4" lift with no Sye and off roaded just fine. Only add parts that you need and don't just add parts that you think you will need, every car is different. That's what I learned, Another example is a friend with a TJ 4" lift no SYE drove and off roaded just fine until he got death wobble. Is off roading with manual hard? Anything I should know beforehand? I'm more worried rolling back and hitting someone else when I try to do a dead start on a hill or burning out the clutch on the trail. I've never done any of those things on the road. But if trail riding is as slow as the videos show then that's basically first or second gear all the way though. 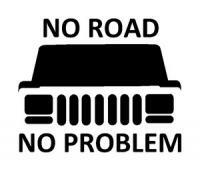 Its true the the definition of off road can be defined by some as being a pavement princess, but Id rather not be that type of person and actually do what jeeps were, what in my mind made to do, and that is off road. Off road builds can be defined as some as lifted trucks or 4x4s with giant mud terrain tires and ridiculous size lifts, but also the only off roading they see is either snow covered roads or dirt and gravel roads. AKA Mall crawling or being a pavement princess. Then the other definition of off road builds means a legitimate one, taking the time to actually armor your vehicle for wheeling, doing research for which lifts would suit you best for your application. Which tires you would want, Mud terrain or All terrain. Aka using the vehicle what you built it to do, real off roading. My off road build I'm not sure, I personally don't know what the off road parks are like here in TN, but I will build it to best suit my application in the field. I've never been mudding but I have a feeling its as if what the videos portray it to be, A giant open area with either a giant puddle or lake then you go all out though that water and mud field and hope not to get stuck. Or if its rock crawling type of terrain, Id build it to that specification, I.E More armor. What I'm going to focus on is a trail build type of rig which would fit my description of an off road rig. Depending on what the type of Wrangler I get either a YJ, TJ, LJ, JK, or if I get a cherokee XJ I have different builds in mind to best suit me. I know that for right now since I consider myself an entry level off roader I will either get a 3-4" lift with no BL and either 32"s or 33"s with the I6 5 speed if YJ or TJ, or the LJ, JK 5 or 6 speed, If i get a XJ Cherokee I would get 3" lift maybe a 3.5" with 31's, 33"s if I cut and fold the wheel wells.